Priyanka Chopra with Raveena Tandon at Manish Malhotra’s bash on Tuesday. New Delhi: While there has been a lot of talk in B-town about global icon Priyanka Chopra and her rumoured boyfriend Nick Jonas’ engagement, there is no official confirmation as of yet. However, it seems like the ‘Quantico’ star is ready to make it official as she recently flaunted a ring on her engagement finger. Priyanka attended Manish Malhotra’s bash on Tuesday with other Bollywood celebrities namely Raveena Tandon, Kajol, Karisma Kapoor, Janhvi Kapoor, Sara Ali Khan, Aditya Roy Kapur among others. 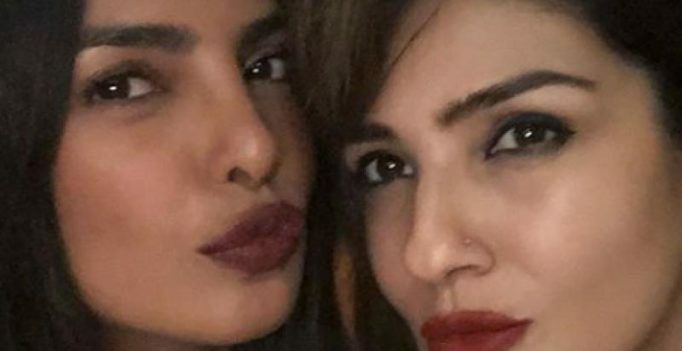 Taking to Instagram, Raveena Tandon shared several photos from the bash with Priyanka. In the pictures, the actors can be seen sharing a light moment where Priyanka can be spotted wearing a huge rock on her ring finger. The news of the couple’s engagement came after Bollywood director Ali Abbas Zafar said that Priyanka opted out from his upcoming flick ‘Bharat’ in the ‘Nick’ of time, owing to a very “special reason”. The speculation about their relationship brewed after the pair met each other’s family. First, Chopra met Jonas’ family at his cousin’s wedding in New Jersey, after which Nick traveled to India to meet Chopra’s mother.